Waverly Willis juggles duty as a part-time marriage counselor, psychiatrist, spiritual advisor, voice of reason and expert listener, all while being a full-time professional barber at Urban Kutz Barbershop, a business he founded in May 2008. Voted Best Barbershop by Cleveland’s Hotlist, Willis takes pride in providing an upbeat, diverse and enjoyable atmosphere for all his clientele. Waverly is also a part of JumpStart’s Core City: Cleveland Impact Program, an intensive business assistance program designed to support the development and growth of businesses located within Cleveland’s core neighborhoods. We recently sat down with Waverly to discuss how years of bad childhood haircuts influenced his career choice and how the Core City: Cleveland Impact Program has helped him to refine the entrepreneurial skills he began developing at an early age. What inspired you to create Urban Kutz Barbershop? First, I have to give my mother all the credit. She was a single parent, she had three boys, and she used to cut our hair, but she used to do a terrible job at it. The kids would all laugh at my brothers and I, and they tortured us with their jokes after we’d get a haircut from our mom. One day when I was about eight years old, my mother sat me down for my bi-weekly haircut, and I remember it like it was yesterday. I grabbed her by her wrist as she was approaching me with the clippers in hand, and I said, ‘Mom, can I please just cut my own hair?’ And she said, ‘I don’t care who cuts your hair, as long as it gets cut.’ Thus, began my career as a barber. I was my very first client, and I did a terrible job—probably worse than my mother did. The kids would still laugh at me and make fun of me. But eventually, I started getting better at it. I started grabbing the kids in my neighborhood that were younger than I was, and started cutting their hair. Their parents came from the same demographics—single parent homes that couldn’t afford to send their kids to a barbershop. When I cut their hair, they might have had a crooked line up or an uneven haircut, but it looked better than what they came into the door with, so they didn’t mind. And it was free, so you couldn’t beat the price. Soon after, the very same kids that were laughing at me were starting to pull me to the side and ask me if I could cut their hair. On Saturdays, I was down in the basement cutting hair all day. I was charging $3 a head and my mother would charge me $1 per person for her electricity. What separates Urban Kutz from your competition? There are a few type of businesses today that are very segregated, and one is barbershops. In a white-owned barbershop, there will be predominately white clientele. In a black or Hispanic-owned barbershop, there will be predominately black or Hispanic clientele. You won’t find that at Urban Kutz Barbershop. On a typical day at either one of our locations, we could serve a doctor, a lawyer, a lesbian woman, a gay man—everyone is welcome—and everybody is laughing, we’re all having a good time. 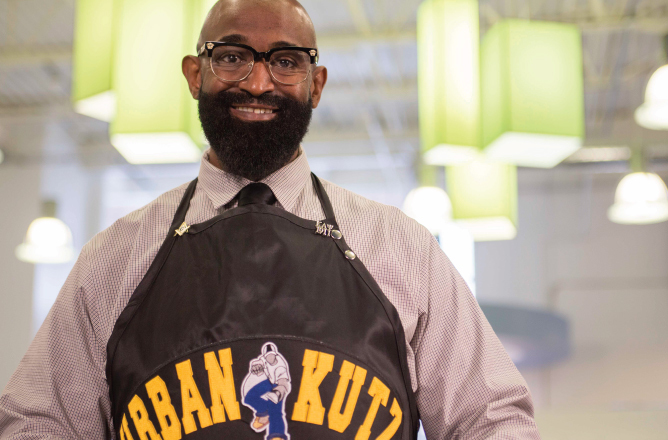 Urban Kutz Barbershop is the barbershop of America. This is the culture that I’ve created, and this is the culture that I continue to nurture through my staff and myself. What have been some of your biggest takeaways from the Core City: Cleveland Impact Program? My experience with the Impact Program has been tremendous. On the first day of class, I told them that I was pretty nervous because until this point, I had been doing business basically by common sense. I really had no formal training in business, but the Impact Program has been very sensitive to that. A lot of the time, I asked them to break some of the terms down, and they were very insightful with explaining things in detail. They took the time with me, and they have taken me by the hand and invited me to a lot of different workshops, and now I am really getting a formal knowledge of business and how it works inside and out. They’re also helping me with my networking. I’m meeting so many like-minded people that I can reach out to—people that are going through the same things that I’m going through as an entrepreneur. It can be a lonely space sometimes in the world of entrepreneurialism, because not everyone understands you. Has anything surprised you about the Core City: Cleveland Impact Program? Again, I never had a formal business education, so I thought a lot of people were going to talk over my head and give me technical jargon that I wouldn’t be able to understand. Instead, they met me right where I was at. This is really a great group of people, I can tell that they don’t take this program as just a job or a career; they’re not in it for a paycheck. They really want to see me prosper. That is instrumental for me. I’m the type of person that won’t work well with you if I don’t think you have my genuine concern at heart. Within the next two years, I plan on opening a location in Downtown Cleveland. In five to ten years, I plan on having nine locations strategically located around the city of Cleveland. I want to take over the city and then I want to go national with Urban Kutz Barbershop. I know I can do it, and JumpStart, Core City: Cleveland and the Impact Program have solidified my confidence that I can do all of these things if I continue to polish my skillset, polish my business savvy and stay connected with great people. I’m dreaming big and JumpStart is really pouring gasoline on top of my fire.